Sorry for the rather long absence, guys, it is due to a mix of being too busy and having internet issues. Hopefully these are fixed for good now. 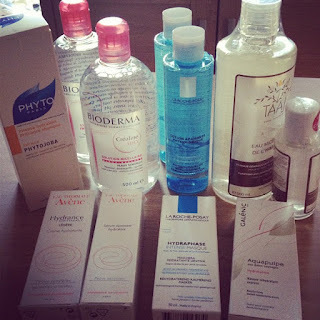 Last week I did a little trip to France to visit a friend and go pharmacie-skincare shopping. Most of the time I can find these products where I live, but the prices are marked up ridiculously, sometimes more than the double. So not only do I stock up in France, I also know where the cheapest pharmacies are so I really get the best deals, and I can go a wee bit happy with the shopping. Phyto Phytojoba shampoo: I had told you I liked it but it was too expensive at 16€. Turns out it's 7€ in France so I caved and got a new bottle. Bioderma Crealine H2O: no need to present this one, and at 8.45€ a bottle (instead of 18.50€ here), I always stock up for a few months. Also, they now have a formula for very dry sensitive skin. La Roche Posay Lotion Physiologique: this is a toner that I use in the morning to rinse off the night, followed by a spritz of Avene Thermal Spring Water (which I forgot to buy a back-up, of, silly me!). Also great for lotion masks with the japanese sheet masks, it's a moisturizing alcohol-free product. Taj Micellar Lotion: after being unimpressed by this when trying it last Summer, I grew quite found of it, of its fresh smell and of the plump effect it gives to my skin. I'm glad we're reunited and there was a mini offered, which is great for travelling. Avene Hydrance Légère moisturizer and Avene Soothing Hydrating Serum: my new star duo to fight dehydrated skin. I will review them soon! Galenic AquaPulpe mask for dehydrated skin: I was convinced to try this by the pharmacist. Galenic is made by the same pharmaceutical company as Avene, but this brand is more luxurious and cosmetic, products are scented etc... Apparently this mask is more of a water formula, which means that it absorbs really fast, and you can use it in the morning in just 3 mins before applying your moisturizer and makeup. So I thought it would be nice to try it, and I will of course report. I am very please with all these lovely products, it's crazy how much a pharmacy skincare haul can be satisfying. Actually, I didn't even buy makeup at all on that afternoon, despite all the temptations around! I spy quite a few products I love in there! I'd be interested to hear about the Phyto shampoo, I almost got some when I was in France but couldn't quite justify it since I've got a few hair products to use up first! *Drool* Oh how I miss la pharmacie! La Roche Posay Hydraphase Intense Mask sounds yummy. I don't think I can get it here in Hawaii, may try to pick it up next time I am in the continental U.S.!